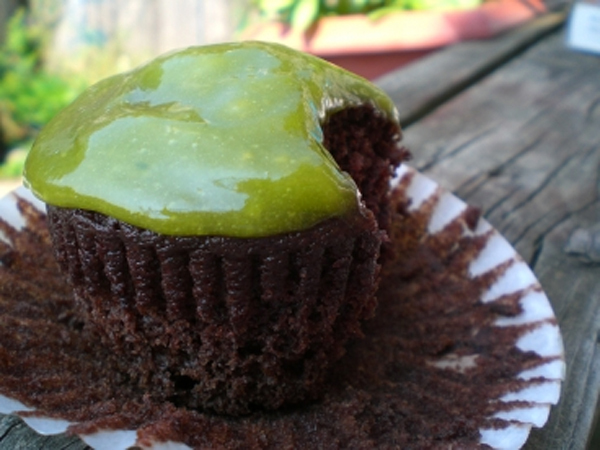 On St. Patrick’s Day, we had a party to go to and I decided I was going to make cupcakes. Going through my Twitter feed, Alton tweeted his Avocado Buttercream Frosting recipe. I thought, hey, why not give it a try. Reading the reviews of the recipe, it seemed to be a hit or miss. I found that the taste was a bit off for a frosting and the consistency was more of a glaze than a pipeable buttercream frosting. If you want to try something new, give it a try, however I won’t be doing this one again. I didn’t get a picture in, but it resembled a green slimy color, much like that of a Ghostbuster’s sliming. This is the first thing from AB I’m not thrilled with, but every other recipe has made me swoon, so I’ll let this one slide. Peel and pit the avocado. Place the avocado into the bowl of a stand mixer fitted with the whisk attachment along with the lemon juice and beat until lightened in color, approximately 2 to 3 minutes. Add the powdered sugar a little at a time and beat until smooth. Add the lemon extract and mix to combine. If not using right away, store in the refrigerator.